Richard J. Reynolds High School (often simply R.J.R. High School) in Winston-Salem N.C. is named after Richard Joshua Reynolds, the founder of Reynolds Tobacco Company. The R.J. Reynolds Memorial Auditorium is adjacent to the school and is often used for school functions. R.J. Reynolds High School has proudly served the community of Winston-Salem since its opening in 1923. The school fulfilled the need for a new city high school after the 1913 merger of Winston and Salem which became a necessity after fire destroyed Winston High School on Cherry Street. The site for the new school was made possible through the generosity of Katherine Smith Reynolds Johnston, the widow of R.J. Reynolds. Construction on the school began in 1919, under the direction of Reynolda Estate architect Charles Barton Keen. The school and auditorium sit on a piece of land known as “Silver Hill” during Reynolds-Johnston’s time. Original plans for the school included two grand school buildings sitting on either side of the auditorium. After the first school was finished in 1923, construction on the second building was delayed and eventually abandoned after the Stock Market Crash of 1929. Reynolds Auditorium and The Winston-Salem/Forsyth County School System is now planning to build a fine arts/performing arts center on the school grounds directly behind the Auditorium, between it and Hawthorne Road. The original buildings, having completed extensive renovation, have recently been designated to the National Register of Historic Places because of their architectural significance and continued contribution to the public education and cultural life of Winston-Salem. Reynolds High School has been recognized nationally for contributions in a variety of academic endeavors. Made possible through the philanthropy of Katherine Smith Reynolds-Johnston, the widow of R. J. Reynolds and the mother of Zachary Smith Reynolds, who donated the land for the School and the Auditorium. The School and Auditorium sit on a piece of land known as “Society Hill”. Original plans for the School included two grand school buildings sitting on either side of an Auditorium. Construction on the School began in 1919, under the direction of Reynolda House architect Charles Barton Keen. The first classroom building was finished in 1923, but construction on the second building was delayed and eventually abandoned after the Stock Market Crash of 1929. In the early 1990s, the high school building was thoroughly renovated and restored to its original appearance with some modern updating (e.g., a computer lab to replace the former language lab, and central air-conditioning). The R. J. Reynolds Memorial Auditorium is on the campus and is often used for school functions. The auditorium was constructed in 1924, and a formal opening was held the same year, with Harry Houdini performing. An extensive renovation was completed in 2003. A customized acoustical shell was added to Reynolds Auditorium in 2009. A fine arts/performing arts building, named the Judy Voss Jones Arts Center for a member of the class of 1968, is on the campus between the R. J. Reynolds Memorial Auditorium and Hawthorne Road. 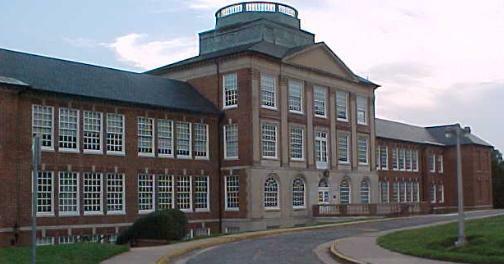 Reynolds became a magnet school for the arts in fall of 2007. R. J. Reynolds is a long-time chief rival of the nearby Mount Tabor High School. This rivalry is fed by the fact that many students developed friendships across school lines. The schools are close enough that neighborhood friends often wind up split between the two schools. More recently, a rivalry has formed between Reynolds and the new Reagan High School due to several students and teachers having left Reynolds to attend or teach at Reagan, including former principal Stan Elrod, and former basketball head coach Howard West. From March 30-April 2, 2007, the R. J. Reynolds Key Club, along with several R. J. Reynolds Junior Civitan members, played a basketball game for 72 consecutive hours to raise money for UNICEF, breaking the Guinness World Record although the Record is not recognized by Guinness. Marc Johnson, a professional skateboarder and recipient of Thrasher Magazine‘s 2007 Skater of the year award. Lois Patricia (Peaches) Golding née Hauser, High Sheriff of Bristol, England, 2010-11. Will Blackwell, Randolph-Macon and Appalachian State University basketball player. Thank you to wikipedia.org for the Information on this page.